Pastry Chef Richard Capizzi has honed his skills under some of the world’s most renowned chefs from Thomas Keller to Jean Louis Palladin to Pascal Brunstein. Drawing inspiration from the pastries of his Sicilian and Neapolitan family, he likes to combine classic flavor combinations with refined technique and modern plating to elevate traditional, modest recipes to the level of fine dining. Capizzi is the rare expert in all the baking and pastry arts, creating an ever-changing selection of chocolates, candies and caramels, gelato and sorbet, pasticcini, elaborate cakes (including wedding cakes), and breads such as focaccia, grissini, and carta di musica. 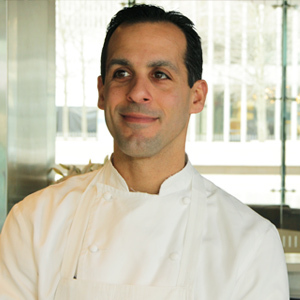 Capizzi won the title of Pastry Chef of the Year at the 14th Annual U.S. Pastry Competition in New York in 2003. In 2009, Capizzi was honored as one of the top 10 Best Pastry Chefs by Dessert Professional.